As the cogs start turning for the May federal election, Australia's fragile housing market is set to be a key issue faced by the two major parties. Many investors will be looking to see what Labor and Liberal have in store to help stabilise the sliding market. One policy that will be on the minds of investors is negative gearing, specifically Labor's plans to repeal the policy, and the Coalition's commitment to leaving it untouched. So what would a change in negative gearing look like for investors and the market as a whole? Who stands to win and who stands to lose, and would it ultimately cause instability in an already tipsy market? Let's take a closer look at the policy, and what a change might spell for Australians. Negative gearing in Australia is most commonly talked about in conjunction with investment properties. A property is negatively geared when the rental return is less than interest repayments of the property combined with costs, such as strata fees and bills. Properties can also be positively geared if repayments and outgoings are covered by the rental returns. Under current laws, Australians can claim tax concessions if their property is negatively geared. Here's a bit of an example. Janice has a steady income and owns her own home, but she wants to buy an investment property. Janice applies for a loan to buy an apartment and the bank manager says, "Yes you can, Jan," and approves a loan for $400,000. She finds a slick two-bedroom apartment and a lovely couple to move in, giving her $1800 a month in rental returns. All happy days then? Not quite. Janice has to pay the bank back $2000 a month, and on top of that, there are council rates, insurance, maintenance and other expenses which really add up depending on the investment. Let's say she's out of pocket $1000 each month, that's $12,000 a year. Not happy, Jan. So what can Janice do? Well, she can claim this $12,000 as an income tax deduction. Say she earns a yearly salary of $100,000, a $12,000 deduction makes her new taxable income $88,000. That's pretty savvy, Jan! So it seems like a pretty good idea then, right? Giving more opportunity and stability to invest. Losses are deducted from taxable income, meaning while there may be a total net loss for a while for investors, as it grows this becomes less and less until the investment is positively geared. Those that argue for negative gearing say that the investment strategy encourages investors and keeps the market fresh and dynamic. 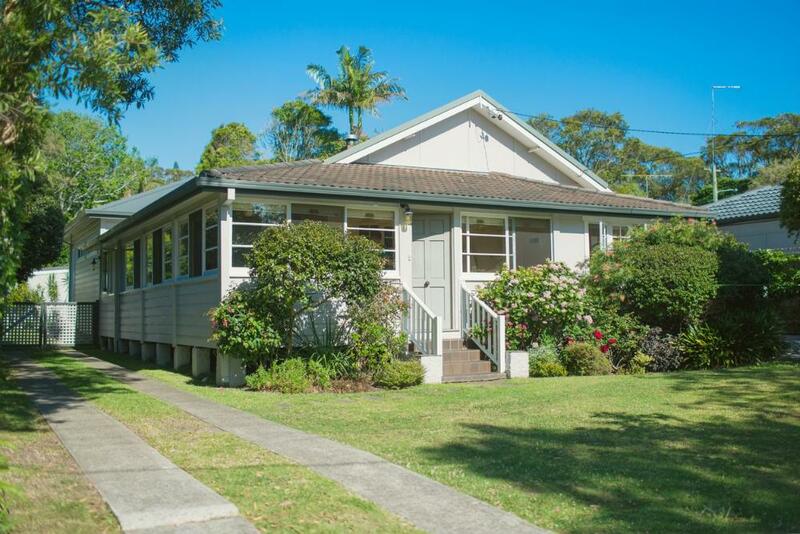 However, on the other side, some say that negative gearing shuts out new buyers from the market. They have to compete with seasoned investors who may already own several properties that are negatively geared. Another criticism is that negative gearing majoritively benefits those with higher incomes, as well as the fact that tax concessions granted to investors means lost revenue for the Government, which has to be made up in other areas. 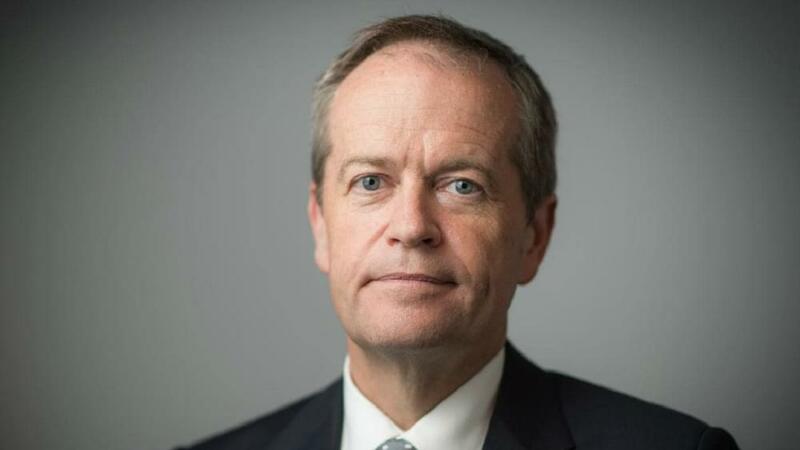 According to Labor's Positive Plan to Help Housing Affordability, Labor will limit negative gearing if elected in the May election, meaning new investors won't be able to deduct losses from their taxable income. Despite this, the changes won't apply to newly-built homes and those with existing investment properties. Shadow Treasurer Chris Bowen recently stated that "If you already use negative gearing, nothing changes. It's not retrospective. And you can still use it for new houses." "Federal Labor's plan is good for the budget, good for housing construction jobs and fair for first home buyers." He also confirmed that the changes will be made by January 1st 2020, which he claims is a sensible time to introduce measures, "This allows it to come in at a quieter time in the property cycle - obviously Christmas and New Year being a quieter time - a good smooth time for implementation." In addition, capital gains tax discounts will also be halved for investments after January 1st. Labor's policy website states that these concessions have given investors an unfair advantage over first home buyers, as well as the fact that 2015 marked the first year that investors outnumbered owner-occupiers. "...2015 marked the first year that investors outnumbered owner-occupiers." Labor's claims are supported by a study performed by the Grattan Institute, which found that negative gearing concessions and capital gains tax concessions have given investors an unfair advantage. Mr Bowen has also stated that changes to property tax policy will raise $2.9 billion in added revenue for the government. The Liberal Party will not make amends to negative gearing tax deductions and policymakers within the party defend the measure and continue to attack Labor's plan to remove the measure. 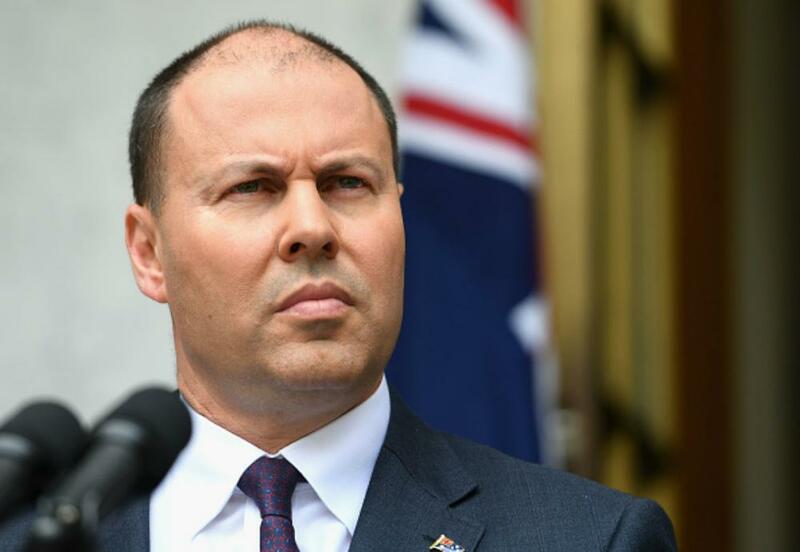 The Liberal party website contains a recent contribution from Treasurer Josh Frydenberg claiming that Labor's plan to limit negative gearing will have dire consequences. "In its determination to drive property prices further down, Labor is taking to the next election a policy to limit negative gearing to only newly constructed housing and to cut the capital gains tax discount on assets that are held for longer than 12 months from 50 to 25 per cent. "The Liberal Party will not make amends to negative gearing tax deductions and policymakers within the party defend the measure and continue to attack Labor's plan..."
About two-thirds of those with negative geared properties have a taxable income of less than $80,000, and of everyone claiming a net rental loss, 70 per cent do so with only one property and 72 per cent claimed a net loss of $10,000 or less." If Labor wins the coming election, those that currently own properties and those that purchase new properties will still be able to claim deductions after January 1, 2020. Despite these measures, many still warn that winding back negative gearing could be detrimental to the housing market. One such critic is mortgage company boss 'Aussie John' Symond, who told the ABC that curbing negative gearing could tip Australia's already struggling housing market into recession. A new report by Louis Christopher from SQM Research has warned that abolishing negative gearing could cause property prices to fall up to 12 per cent, or an additional 4 to 8 per cent more than prices were expected to drop during the period. It also states that rents could rise 7-12 per cent from 2020 to 2022. 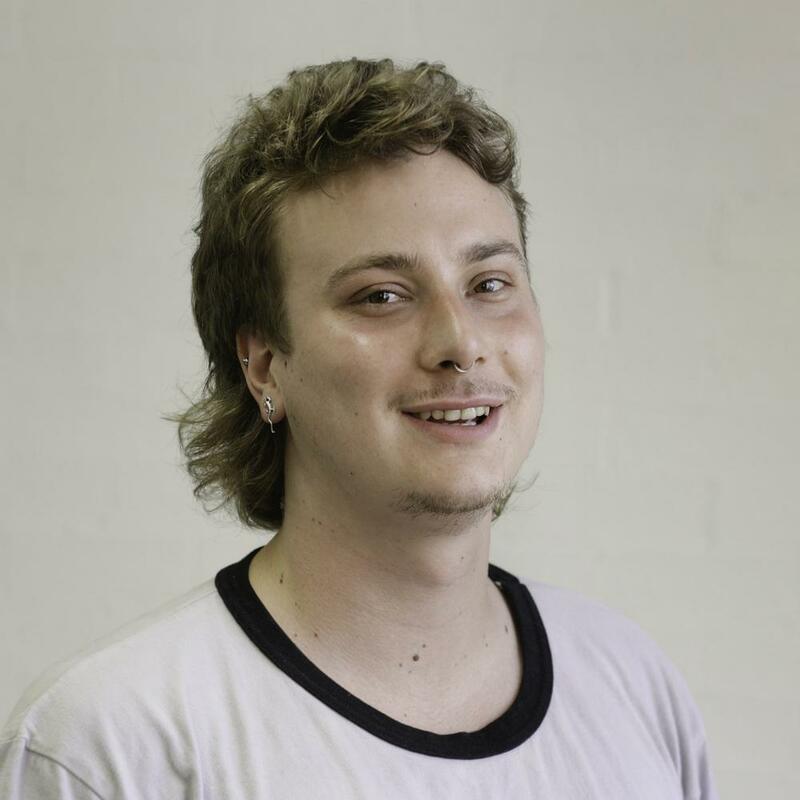 Christopher references the period when the Hawke government abolished negative gearing in 1985, which caused rents to rise in Sydney and Perth, but not across the whole country. "...when the Hawke government abolished negative gearing in 1985, rents rose in Sydney and Perth but not across the whole country." The report also predicts a drop in property sales turnover, resulting in a loss in stamp duty revenue of around $2.3 billion and a decline in construction completions by around 25 per cent. 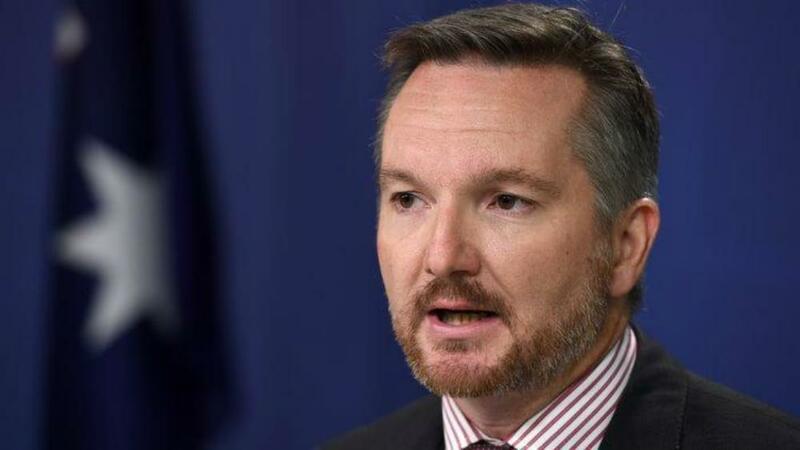 On the other side, the findings of a new report by the Reserve Bank of Australia has given ammunition to Chris Bowen to claim that criticisms from the Liberal party are nothing but "scare tactics". The report states that removing negative gearing concession will significantly increase owner-occupied households. The report also point towards rentals increasing and house prices falling, but it states that overall more Australians will be better off. "The welfare analysis suggests that eliminating negative gearing would lead to an overall welfare gain of 1.5 per cent for the Australian economy in which 76 per cent of households become better off." Of course, these figures are just speculations, however, there is good evidence to suggest that negative gearing could shake up the housing market, and in the very least cause housing prices to continue to slide. One of the Liberal Party's main positions is that removing negative gearing concessions will affect Australians on an average taxable income, below $80,000. This is based on statistics released by the Australian Taxation Office, which state that 62 per cent of people who negatively gear a single property have a taxable income under $80,000 (note this excludes those who negatively gear multiple properties. Treasurer Josh Frydenberg even claimed that "No doubt many of those are among the 58,000 teachers, 41,000 nurses and 19,000 police and emergency service workers who negatively gear property." Despite this, some have found the statistics to be misleading or taken out of context. As the ABC has highlighted taxable income is a poor way to depict whether a household is wealthy, as often those who are well off use tools to reduce taxable income, including claiming business losses, transferring assets to family members and of course, negatively gearing tax concessions. Professor Miranda Stewart from the Tax and Transfer Policy Institute at the Australian National University stressed this point to the ABC stating "It's not a very good indicator of who benefits from negative gearing because it already incorporates it." 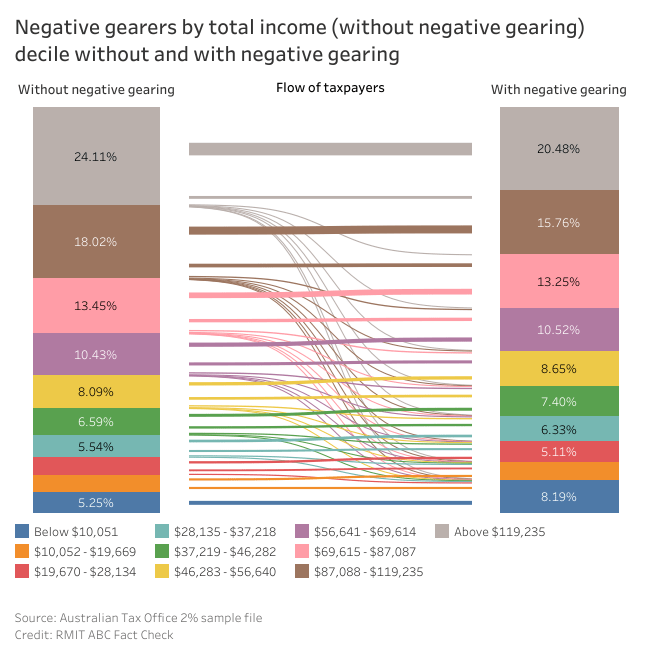 It is highly debatable who benefits the most from negative gearing, but according to the Grattan Institute, the top 20 per cent of those claiming negative gearing concessions get 53 per cent of the overall benefits from the concessions. Chief Economist at UBS, George Tharenou has expressed concerns about the effects that removing negative gearing may have on Australia's fragile economy, but also told the ABC that the benefits are stacked towards those with higher incomes, "Negative gearing provides an opportunity for all taxpayers to reduce their income and incentivises them to invest in property, but the benefits of those gains have been relatively concentrated." "The Chief Economist at UBS has expressed concerns about the effects that removing negative gearing may have on Australia's fragile economy." "Higher-income people pay more tax and that's the way the system works — the more tax you pay, the more tax you save. So the benefits were always going to be skewed towards higher-income households." Many also have a concern that there are those that take advantage of the system, negatively gearing multiple houses. Tax data from 2015 highlighted that the biggest trend amongst negative gearers by properties held was in the category that owned 5 properties, followed by those that owned 6 or more. The statistics also showed that lawyers, surgeons and anaesthetists are among the most represented occupations that negatively gear. Negative gearing is no doubt a complex issue, and no matter their credentials, no one really knows what will happen if a Labor government repeals the measures. Could it mean doom for the housing market? Or is it just what Australia needs to help younger buyers into the market? Time will tell, however, there are some common thoughts that probably give a decent overview of what we could expect. Those currently using negative gearing concessions will be unaffected, as will those that plan to negatively gear new property. Housing prices may continue to fall further, with some experts speculating that prices could tumble further over the coming years. Rental prices may be pushed up in some states, depending on local rental demand and housing supply. More owner occupiers and first homeowners will be encouraged into the market. Most Australians will have an overall welfare gain after an initial adjustment period.